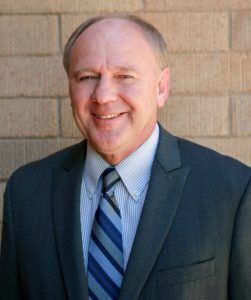 Charles P. Potucek was appointed city manager of the City of Sierra Vista on April 1, 1996. He has worked for the City since September 1986 in several capacities including administrative analyst, budget analyst, and assistant to the city manager. Potucek hold both Bachelor of Science in Public Affairs and Master of Public Affairs form Indiana University in Bloomington. During his 30 years of service to the city, Sierra Vista has experienced dramatic growth and has undergone significant change. Potucek’s accomplishment include the negotiating of the agreement that brought the Mall at Sierra Vista; the Highway 90/92 –Charleston Road commercial cluster; construction of the Environmental Operations Park; establishment of Sierra Vista as a founding member of the Upper San Pedro Partnership; construction of Avenida Cochise and Martin Luther King, Jr. Parkway; the development of the award-winning Sierra Vista transit system; the enhancement of the city's bond rating; and facilitation of improved citizen participation. Capital improvements accomplished during his tenure as city manager include the Sierra Vista Aquatics Facility (the cove) , Sierra Vista Public Library, the Pedro Castro Maintenance Center, components of Sierra Vista’s multi-use path system, renovation of the Ethel Berger Center, Nancey J Brua Animal Care Center, Kiwanis Skate & Bike Court, Fire Station #3, and Centennial Pavilion. Potucek envisions Sierra Vista as a regional center for commerce, health care and education, a model for environmental programs, and expanding upon its history as an outstanding public service provider. Above all, he want Sierra Vista to become a place where children grow up and stay - instead of having to go elsewhere for educational and employment opportunities.